With spring just about here, it will soon be time to put away your winter outdoor power equipment. However, neglecting best maintenance practices now can become next winter’s nightmare if equipment is not stored properly. 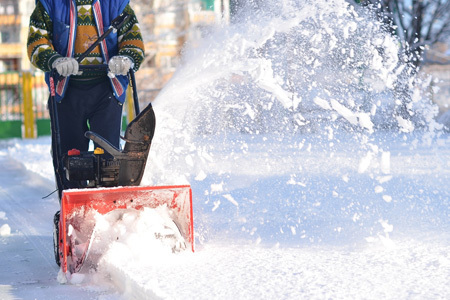 “You rely on your snow thrower and other equipment during the winter months so it’s important to ensure it will be operational next season and precious time isn’t wasted on repairs and maintenance instead of snow removal,” said Kris Kiser, president and CEO of OPEI. Whether it’s a snow thrower or other seasonal power equipment, OPEI offers tips to help contractors avoid fuel-related problems and store their equipment properly. Drain the fuel. The first step in de-winterizing your power equipment is checking the fuel tank. Make sure your equipment is completely off before checking fuel levels. A general rule of thumb is not to leave fuel sitting in the tank for more than 30 days. Untreated gasoline (without a fuel stabilizer) left in the system will deteriorate, which may cause starting or running problems and, in some cases, damage to the fuel system. Drain the old fuel into a gas can and take it to an authorized recycling center, automotive center or organization that can dispose of it properly. Change the oil. Drain the old oil and put in fresh oil. Remove the oil drain plug in your snow blower and catch the old oil in a container. Replace the plug and refill the engine with oil recommended by the product manufacturer. As with old fuel, take the old oil to a location able to dispose of it properly. Remove the spark plug. Store it in a clean dry place where you can easily find it next season. You can pour a very small amount of oil onto the pistons through the hole where your spark plug was removed. This will help prevent rusting or corroding of engine parts. Inspect your equipment. Check for loose belts and missing or damaged parts. If you find anything concerning, replace the parts or take your equipment to a qualified service representative. Make sure none of the safety guards have been damaged, removed or disabled. Clean your equipment. There may be dirt, oil or even grass stuck to it. Give your equipment a good spring-cleaning so it’s ready for next season. Maintenance kits are available to help with these tasks. Just be sure to get the right kit for your model and always follow manufacturer’s recommendations. Cover equipment. Equipment covers keep dust, dirt and debris off the machine and protect your investment. Get safety tips and more online at www.opei.org.